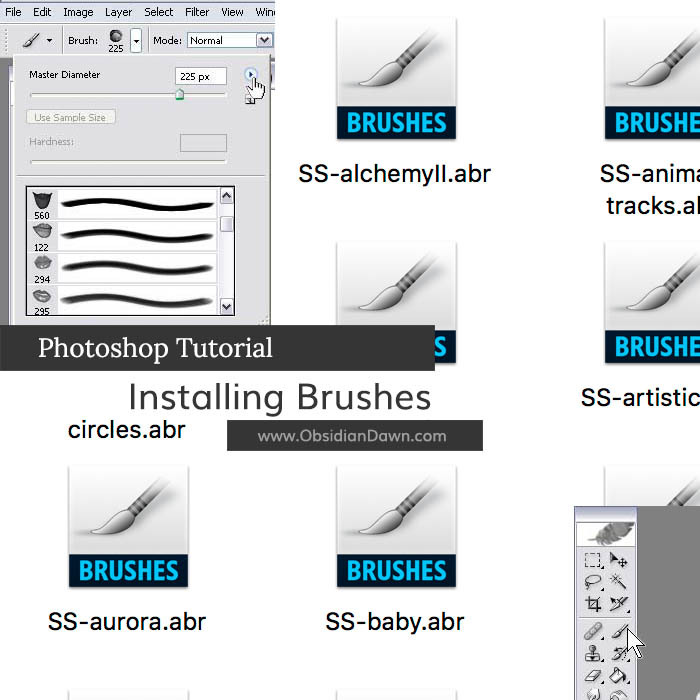 For those that want to know how to install the brushes in GIMP, scroll down to the end of this tutorial or click here. 1. The Photoshop brushes on my site can be found here. 2. Once you have the file(s) unzipped (place it somewhere that you can find the files easily), you should see a file that has an *.abr extention. My brushes were made in Photoshop 7.0. They will work in Photoshop 7 and any Photoshop that came out after that (ie: CS, CS2, CS3, CS4, etc.). They will also work in GIMP 2.2.6+ (for GIMP installation, see below). They work equally well on both a PC and a Mac. If you installed Photoshop differently than what it defaults to, you should still be able to find the Presets\Brushes folder within whatever directory you installed Photoshop. Mac users, you probably installed Photoshop into your Applications folder, so check there for it. Then find Presets > Brushes (if you’re not sure where you installed Photoshop and all else fails, you can always do a search for the brushes folder on your system). This is where you need to place the *.abr file (just copy/paste from wherever you unzipped it to). 4.Open up Photoshop. If you already had Photoshop open, you will need to re-open it. 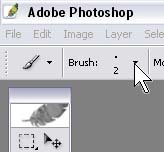 If you install brushes with Photoshop open, they will not show up until the next time you open Photoshop. Select the Brush tool (or really any other tool that uses brushes is just fine, this is just an example). 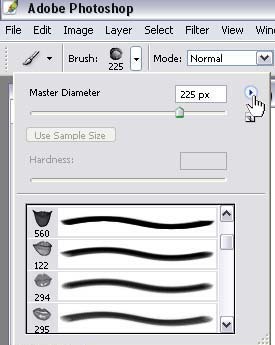 6.Just to the right of the selection of current brushes, click on the arrow that points out to the side. A menu will come up that should list every set of brushes that you have in your brushes directory. 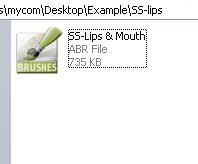 To make my “lips and mouth” brushes active, for example, you would click on “SS-lips”. Photoshop will ask you if you would like to replace the current brushes. You have the option to simply click “OK”, which will do just that – remove the current active brushes from your brushes “palette” and load up the new ones. (Don’t worry, they haven’t disappeared! They can be loaded up again in the same manner in which we’re loading the lips brushes up now.) Your other option is to “Append”, which will append the lips brushes to the end of the list of whatever brushes you currently have active. Either will work, although I like to choose “OK” and have only one set of brushes open at a time. 7.Pick a color, open a new file, and click once somewhere within it. That’s it! To switch between brushes, you just use the scrollbar, click on the brush you want, and move the size slidebar to the right or left to make it the size you wish it to be. Just like with any other brush. To load another set of brushes, you would follow the same procedure. Voila! Installing brushes in GIMP is much the same as it is in Photoshop. The directory changes, and that’s about it. First, unzip the file that you downloaded. Now it should show up whenever you open GIMP among your brushes. If GIMP was open when you installed these, you will need to either refresh the brushes (bottom right of the brushes window) or restart GIMP before they will show up. If you are still having trouble installing GIMP brushes, you’ll need to find troubleshooting elsewhere. I am not a GIMP user, and this is the extent of my knowledge on how to install Photoshop brushes into GIMP.